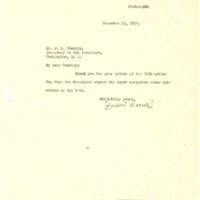 Herbert Hoover thanks Joseph Tumulty for notifying him of the President’s approval of the draft executive order. Thank you for your letter of the 13th advising that the President signed the draft executive order submitted on the 10th. Hoover, Herbert, 1874-1964, “Herbert Hoover to Joseph P. Tumulty,” 1917 November 13, WWP19253, Hoover Institute at Stanford University Collection, Woodrow Wilson Presidential Library & Museum, Staunton, Virginia.